Former racer John Burrows, who now runs the Cookstown B.E. Racing team, says swift action must be taken to safeguard the future of Irish National road racing. Respected team owner John Burrows says he fears the unique spectacle of Irish road racing could disappear for good unless swift action is taken to safeguard the future of the sport. As exclusively revealed by the News Letter in January, the cost of providing insurance cover for National road races in 2017 has risen by as much as £4,500. Clubs are also facing potentially crippling excess payments, which have soared from £1,000 per claim in 2016 to £2,500 this year. In the past week, two popular races in the Republic of Ireland – the Killalane and Kells events in North Dublin and Co Meath respectively – have been called off as a direct result of spiralling insurance premiums. Only three races are due to go ahead in the South, including the famous Skerries 100 (July 1), Walderstown (July 9) and the Faugheen 50 meeting on July 23. Prior to the international North West 200 in May, the Tandragee 100 is scheduled to take place on Saturday, April 22 followed by the Cookstown 100 a week later. Dungannon man Burrows, a stalwart of Irish road racing before his retirement as a racer in 2012, says he is concerned the sport at National level could soon become nothing more than a cherished memory. “When I was racing, we didn’t have a free weekend after the TT until the end of the year: it was great and I loved it. Even when we were going through the recession, there was still good money available at the smaller road races,” said Burrows, who now runs the highly successful Cookstown B.E. Racing team. “Looking back, those were maybe the last of the best days for Irish road racing. It’s a shame and these insurance hikes are going to kill off road racing in time and that is something I don’t want to see happening. The Mid Antrim 150 returned to the calendar last year but has been called off once more due to a financial shortfall, while the Bush road races in Co Tyrone haven’t taken place since 2014. It’s a far cry from the thriving Irish road racing scene only 12 years ago, when as many as 11 National races meant free weekends were few and far between for competitors from April through to September. In January, Armoy Clerk of the Course, Bill Kennedy, said he feared the insurance burden faced by clubs could sound the death knell for the sport at National level in as little as three years – a standpoint echoed by Ulster Grand Prix chief Noel Johnston. And ex-racer Burrows, who was recently honoured with a Special Recognition Award at the Cornmarket Motorbike Awards in Belfast, agrees it could be the beginning of the end. “Sadly, we’ve now lost Killalane and Kells and you wonder what is to follow next year. If we lose any more there will hardly even be room to run a proper championship series,” he said. “It seems there are too many claims going in and this is a really heavy burden on the clubs. “It’s easy to sit back and criticise but it is difficult for the organisers to put these events on. “They can’t charge admission, so they’re trying to ask for voluntary donations and people to buy programmes, but there are people who will go to a race meeting and won’t put their hand in their pocket. 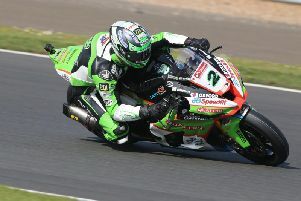 “Road racing has such a big following and if everyone would pay their way in and buy a programme, it really would make such a big difference to these clubs,” Burrows added. “It’s a small ask in comparison to the riders, with the majority of them paying entry fees to entertaint the fans without getting anything back financially.